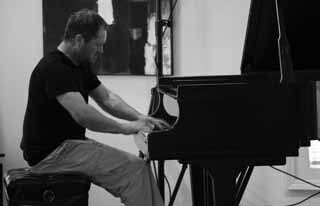 Pianist/vocalist/composer/improviser, recipient of the 2006 National Endowment of the Arts Meet The Composer grant, was born Feb. 23, 1967 in the San Francisco Bay Area of Irish and Cherokee descent. He began his musical training as a young child rigorously studying the keyboard repertoire from the renaissance to the 20th century. After graduating with degrees in both piano performance and composition he chose to become homeless for several years, opting to wander and live out of a backpack, rather than pursue a career as a concert pianist. He spent many years as a grassroots political activist and working in ecological restoration. He is now touring perpetually, the previous year in Europe, currently in the U.S., primarily playing his own comprovisations which he calls post-classical circus punk world jazz free music - for people and everyone else. His music whispers/screams, "there are as many worlds in a life as there are lives in the world". Thollem's travels as a performer have covered much of the North American continent and Europe. He has performed extensively as a soloist as well with groups. He is a founding member of several innovative ensembles, and is responsible, in full or in part, for many albums of original music. He has performed in theaters, art galleries, universities, elementary schools, concert halls, jazz clubs, rock clubs, festivals, warehouses, house concerts, streets, forests, the Shoshone Desert at the Nevada nuclear test site, on television, radio, in circuses, and riots. He has performed piano concertos with symphonies, as an accompanist and composer for opera and modern dance (Limon Company), played in many free improv groups, West African drumming troupes, Javanese gamelan ensembles, and a socio-political bicycle band.